Your body reacts to nearly everything happening around you through your emotions, observations, thoughts and activity. Your brain guides the body by regulating heart and other organs through autonomic nervous system. 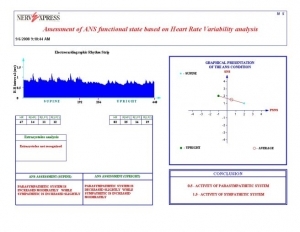 This physiological variation of heart rate, controlled by autonomic nervous system, is called Heart Rate Variability (also commonly known as HRV). Measuring heart rate variation reveals wide range of information about your body and health. 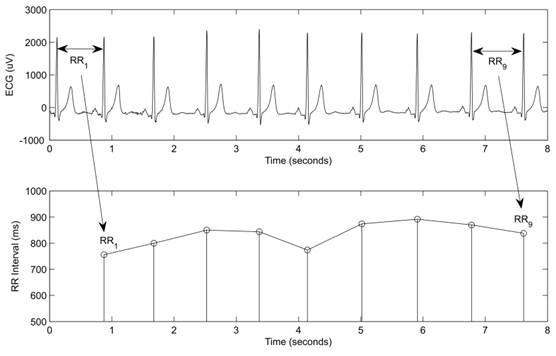 Heart rate variability (HRV) is calculated based on variation of time in milliseconds between two heartbeats. HRV varies as you breathe in and out (see picture below). One sensitive and important measurement is called HRV deep breathing test. This unique 1 minute deep breathing test (DBT) provides instant real time information about your acute stress level. Through follow up measurements it is possible to evaluate your health more in-depth. From figures 2 and 3 you can see simple results of the 1 minute deep breathing test. These results can be utilized when analyzing your health and acute stress. Constantly poor results in DBT may be caused e.g. by high blood pressure, heart disease, obesity, diabetes, mental disorders (e.g. depression) or chronic stress overload.